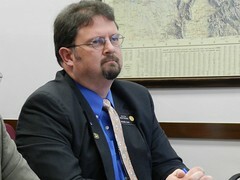 Senate Minority Leader Bill Cadman (R-Colorado Springs) and Senator Kevin Grantham (R-Cañon City) both heavily criticized Senate Democrats today for passing another disastrous election bill out of committee. HB 1164 was passed out of the Senate State, Veteran, and Military Affairs Committee today on a 3-2 party-line vote. Republicans have consistently criticized the lack of residency requirements to vote in local elections in HB 1164 and its precursor HB 13-1303. At a press conference in the capitol on Monday, Senate Republicans introduced an alternative to HB 1164, a bill to take a 2-year “time-out” on last year’s HB 1303 and allow officials to conduct all elections under the well-established rules that existed prior to 1303. The bipartisan timeout proposed by Republicans would allow time for the establishment of a truly bipartisan commission – modeled on the very successful Flood Disaster Study Committee, which had equal membership from both parties-- to study our election laws and come forward with new legislation that is genuinely bipartisan in character. When HB 1164 was introduced on January 21, it had two Republican cosponsors, Rep. Carole Murray and Sen. Ellen Roberts. Last Wednesday, both of these lawmakers acted to take their name off of the bill citing the lack of local residency requirements for local elections as an unacceptable proposal.